Styria is an Austrian province, with a population of 1,184,593, spreading over 16,379 sq km, part of central and SE Austria. Its capital is Graz, and on its south line bordering on Slovenia. Styria is predominately mountainous, with many forests, pastures, and meadowlands. The province is drained by the Mur, Enns, and Raab rivers. It is the chief Austrian mining district (iron ore, lignite, salt, graphite, gypsum, talc, and magnesite) and has a well-developed metals industry, particularly in the north, near Erzberg. The province also produces paper, cellulose, chemicals, leather, textiles, and food products. Styria was originally settled by Celts and was later part of Roman Noricum and Pannonia. By 1282 Styria and Carinthia both became hereditary Hapsburg lands. By the end of World War I and the Treaty of Saint-Germain in 1919, Styria's southern portion was ceded to Yugoslavia and is now part of Slovenia. This short historical overview is just a glimpse into an area where many different nations and authorities fought for power and influence which made the area a melting pot. Since Styria is bordering Slovenia on its Southside and you can drive from Graz to Maribor in under one hour the communities on both sides of the border are well connected - socially and economically. The Styrian capital, Graz, is also the center of the local startup ecosystem. Traditionally, Graz is the center of the motor-vehicle assembly in the area. Tourism is a major source of revenue since there are many Alpine resorts nearby. 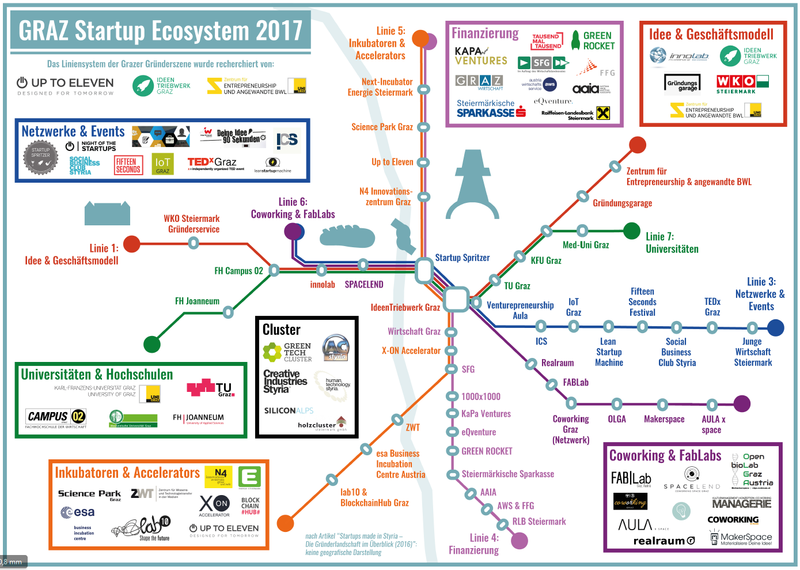 Periodically the main ecosystem organizations, accelerator Up To Eleven, IdeenTriebwerk Graz and Zentrum für Entrepreneurship und Angewandte prepare a graphics ecosystem overview where they list and categorize all the important and vital ecosystem support organizations. The community is regularly gathered on networking event called Startup Spritzer, organized by the IdeenTriebwerk Graz. You can see the graphic on the link.